It’s known as the historic reversal, and it appears irreversible: Places where the old outnumber kids. What began in 1995 in a single country, Italy, will spread to 56 nations, economies as diverse as New Zealand and Georgia, by 2030. These are the findings of Joseph Chamie, who spent a quarter of a century studying population patterns at the United Nations in New York and now is an independent researcher. The former UN head demographer compared population projections of kids under the age of 15 to that of people aged 65 and over. It’s not just industrialized nations like Japan and Germany succumbing to the age curse. The turning point will take place in 2020 in the Cuba and South Korea, followed five years later in Thailand and the U.S. By 2075, the global population is forecast to pass the demographic milestone. While the prospect of longer lives is a good thing, problems arise when a shrinking work force cannot foot the pension bill. Several decades ago, you could have had about 10 workers per retiree, but that could shrink to the point where in Italy, for example, you had three workers per retiree. While the political choices are unsavory — increase taxes or cut benefits — governments are running out of time to act. You “can't repeal the law of demographics,” Chamie said. NEW YORK, Aug 8 2016 (IPS) - It first happened in Italy in 1995. Five years later it happened in six additional countries, Bulgaria, Germany, Greece, Japan, Portugal and Spain. Today the total number of countries where it has occurred stands at 30, including most members of the European Union. 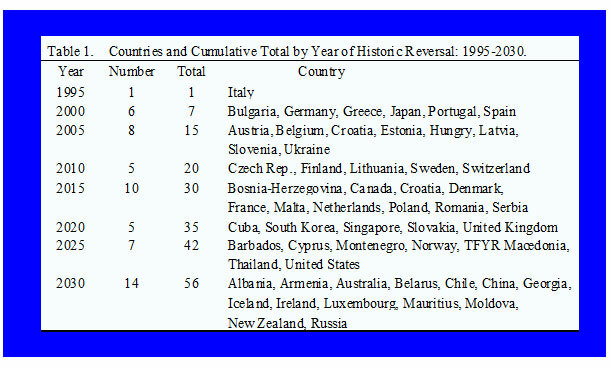 In fifteen years that number is expected to nearly double and include Australia, Canada, China, Russia, South Korea and the United States (Table 1). Oh no, not the Cuba. It wasn't always this way. It used to be taken for granted that the best indicator of a nation's health was its citizens' desire and capacity to reproduce. I would have thought the opposite had always been taken for granted. It is those countries with high mortality, low education, and significant poverty that have the highest reproduction rates. You need to split that up between pre-reliable birth control era and post-reliable birth control era. It used to be that more prosperous people had more children, because they got sufficient calories to get pregnant in the first place. Pick "England and Wales" and "France" -- why did Catholic France have a lower birth rate than Protestant England/Wales in the 19th century? We have already seen that as a country develops – child mortality declines and incomes grow – the fertility declines rapidly. The demographers Mikko Myrskylä, Hans-Peter Kohler & Francesco Billari studied what happens at very high levels of development. To measure development they relied on the Human Development Index – a measure published by the UN that combines with equal weight indicators of a country’s health, material living standards and level of education. The visualization below shows their finding. Again they found the strong negative association between a country’s level of development and the fertility level. But the most recent data also indicate that at very high levels of development – HDI over 0.85 or even 0.9 – this association is reversed. Higher development then leads to increasing fertility. In the paper the authors do not only show this relationship cross-sectionally but also over time: after reaching the lowest Total Fertility Rate at HDI values between 0.85 and 0.9 fertility then increased again as countries advanced to the highest development levels. It is a finding with important consequences. The authors note that this reversal “has the potential to slow the rates of population ageing, thereby ameliorating the social and economic problems that have been associated with the emergence and persistence of very low fertility”. Looking at the graph itself, tho, it really looks like it decreases up to that 0.85 point... and then is basically flat. Last week's chart showed that the world is turning Japanese with tales of economic malaise, extreme monetary policy, and negative rates. Germany, with its five-year government bond trading at a -0.33% yield, is no exception to this story. However, negative yields are not the only concern that the country has in common with Japan. It's the overall demographic picture that is worrying, and it could have a big effect on Germany's economic future as well as the tough choices that must be made today. Germany is the most populous and productive economy in Europe, with 80 million people and a gross domestic product of almost $4 trillion. It's also the world's third-largest exporter, and that's why it had the largest trade surplus globally in 2014 with $285 billion. For all of its economic power, Germany has a key weakness that could potentially be its Achilles' heel: It's projected that Germany's population will decline significantly over the coming decades, and the ratio of workers to dependents will become one of the worst in the world. In the future, it is likely that there will not be enough youth or workers in the country. As baby boomers retire, there will be a larger burden placed on those paying into the government's social safety net and other programs. Further, this widening gap will also mean a significant loss of experience, skill, and know-how in the workforce that will create coinciding economic challenges for the population. TOKYO -- Japan's rapidly aging population reached another milestone last year, with the number of seniors aged 75 and older surpassing that of children for the first time. The internal affairs ministry announced the final results of its 2015 population survey Wednesday. The overall population, including foreigners staying in Japan for at least three months, came to a little over 127 million as of Oct. 1, 2015, down about 960,000 from the 2010 figure. This marks the first overall decline since the quinquennial survey began in 1920. The Japanese-only population, which had already decreased in the 2010 census, came to around 124 million, down 1.07 million. Seniors aged 75 and up totaled 16.12 million, nearly one-eighth of the population. Children aged 14 or younger numbered 15.88 million. The number of births was not enough to offset deaths. Meanwhile, foreign residents increased by 100,000 to a record 1.75 million, reflecting a rising number of foreign workers in the country. Men accounted for 61.84 million of the total population, and women 65.25 million. Japan still ranks as the 10th most populous country, as it did in 2010. But No. 11 Mexico is nearly catching up. Japan was the only country among the top 20 nations that saw a population decline between 2010 and 2015. Back in 1985, the population of seniors 75 and older was 4.71 million. This more than tripled over the next three decades. Children up to 14 years old decreased about 40% in that period. Last year, children accounted for 12.6% of the population in Japan -- even lower than the two other countries facing a graying population: Italy's 13.7% and Germany's 12.9%. Japan has maintained a stolid rejection of large-scale immigration. Foreigners have difficulty adjusting to the elaborate restraints of social etiquette and the closed nature of society. The Japanese language, with its borrowing of Chinese ideograms and more recently from Western languages, is extremely difficult to learn. Perhaps Japanese view foreigners who come into their culture with more reserve than other societies. Europeans and Americans are accustomed to an ebb and flow of migrants over the centuries but the Japanese are not. Now Japan faces a demographic crisis. Its population is projected to fall from 127 million to 87 million by 2060, when 40 percent of the population will be 65 or older. Unless Japan can reverse or limit this decline, narrowing markets, a growing social welfare burden and an enormous public debt will torpedo the prosperous society. Labor shortages have already contributed to the GDP growth rate falling from more than 3 percent in the early 1990s to only one half of 1 percent. Japan’s continuance as a world leader, with an economy closely allied with that of the United States, has to be an important goal and part of an American world strategy. It’s increasingly likely that China, now entering a period of low growth and likely political difficulties, cannot be more than a reluctant partner — and perhaps an enemy. The United States has encouraged Japanese relations with the Southeast Asians and India since World War II. That could be enhanced if Japan opened the country to Asian immigrants. More change may be on the way. The Asahi Shimbun, the country’s leading liberal newspaper, reports that 51 percent of its Japanese respondents said in a recent poll that they support accepting foreigners; 34 percent say they oppose expanding immigration. That’s an increase of approval nearly 50 percent higher than measured in a similar poll five years ago. Further, more than half of the Japanese polled say they think accepting immigrants will solve the anticipated labor shortage in Japan. There’s grim realism in the respondents’ beliefs. Twenty-two percent say they strongly think accepting more immigrants will weaken national security, and 54 percent said they think it probably will. SHENYANG, China—Here in the northeast rust belt, ailing industries are increasingly less able to pay into plans for retiring workers, as a slowing economy hastens a pension crisis. “It used to be the system took care of you,” said Zhao Zhonghao, a railway engineer in Shenyang who began his career shoveling coal. The 54-year-old is revising his retirement dream of painting, traveling and reading the classics, concerned his pension will be slashed. “I have to be prepared for that,” he said. China’s hopes of growing rich before it grows old are dimming. The burden of supporting each person over 65 is now shared by more than seven workers. But that will drop to just two people in 35 years, according to United Nations data, or even fewer than that, the World Bank says. A low retirement age and a one-child policy in place for 35 years contributed to China’s demographic predicament. Beijing this year began allowing couples to have two children, but few believe the shift will significantly lift a sagging birthrate. The Chinese Academy of Social Sciences, the country’s chief think tank, predicts China’s pension surplus will turn into a deficit by 2023. By 2050, it predicts, the cumulative deficit will be $118 trillion barring significant policy changes. With pension funds administered locally, the pain will come quicker to the northeast. While prosperous southern Guangdong province has more than 50 months’ worth of pension payout in its fund, northeastern Heilongjiang has a single month, the academy said in a July report. It doesn’t help that young people are leaving the northeast, which has experienced net population outflow for more than two decades, according to a government report last month. Beijing says next year it will roll out a plan to raise retirement-age thresholds from the current 60 for men and 55 for women (some groups leave work even earlier). But the proposal faces strong resistance and is expected to take years to implement.